Los Angeles is the second largest city in the United States, but aspects of it can seem almost small town. A sprawl built of people who came from somewhere else, infamous for its superficiality and temporality, it sometimes, surprisingly, produces individuals, deeply rooted in its soil, who live and work here their whole lives, sometimes in an area a few blocks wide. Such is the case with Peter Scholz. He was born in Van Nuys, 53 years ago. He lived at 5812 Lemona Ave in Van Nuys, CA. in a German-American family along with Michaela, his younger sister. 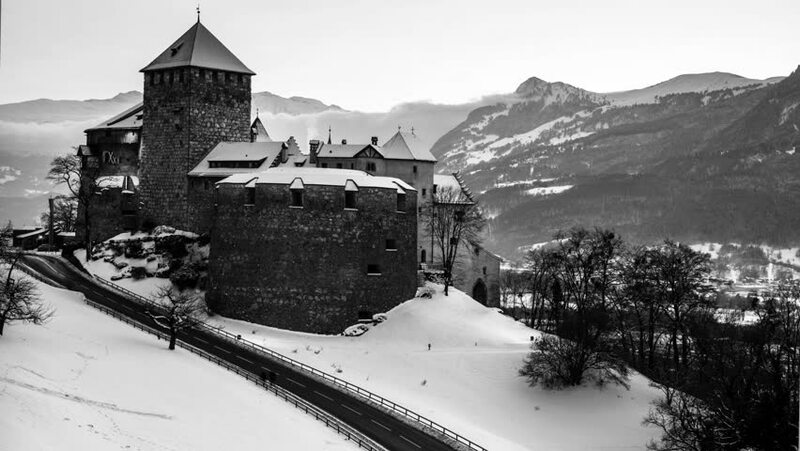 His parents, Heinz and Herlinda, had met in Vaduz, Liechtenstein in 1954. They married, and in 1959, emigrated to Los Angeles, where they found work, as driver and maid, in the Sidman Family estate in Beverly Hills. They stayed there only briefly. Motivated by ambition and hard work, Heinz left his chauffeur job to work as a baker. Meanwhile, they had two kids, Peter and later Michaela. In 1968, Dad opened Scholz Cabinets on Aetna St. in Van Nuys, a location where he did business for the next 20 or so years. Peter worked part-time with his father, graduated from Notre Dame High School and then enrolled in Pierce College “because that’s where the best looking girls were.” He attended two years and graduated in 1984. 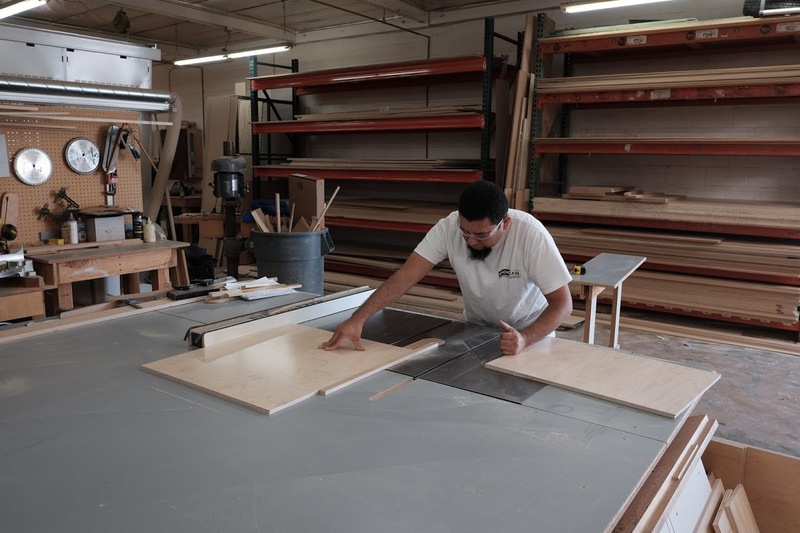 He continued to work part-time with his dad, closely learning the craft of custom cabinet wood making. He was, in effect, going to school overseas, by learning the German way of doing things here in Van Nuys: precisely, exactly, and diligently with strict attention to quality and integrity. Yet Peter had other ideas and passions in his head. He was excited by art, by creative people, by wealth and Hollywood, and by that whole rich world, over the hill, where sculptures, luxurious homes, paintings and grandiosity were on display. Remarkably, he didn’t try and become an actor. He didn’t intern at William Morris. He didn’t affect affectation. He still built cabinets. He used his skills in making them to enter a rarified world. 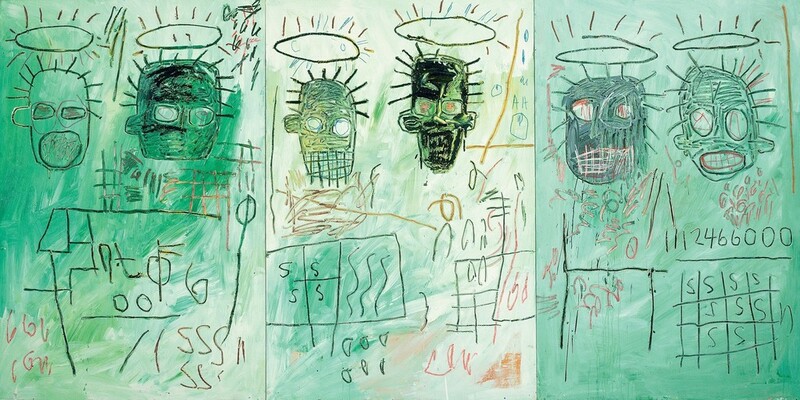 It was the late 1980s, an era of big shoulders, fat cigars, overpowering perfumes (Giorgio, Poison, Opium), Joan Collins, The Brat Pack, Wall Street, Greed is Good, and the explosion of personalities in the art world. 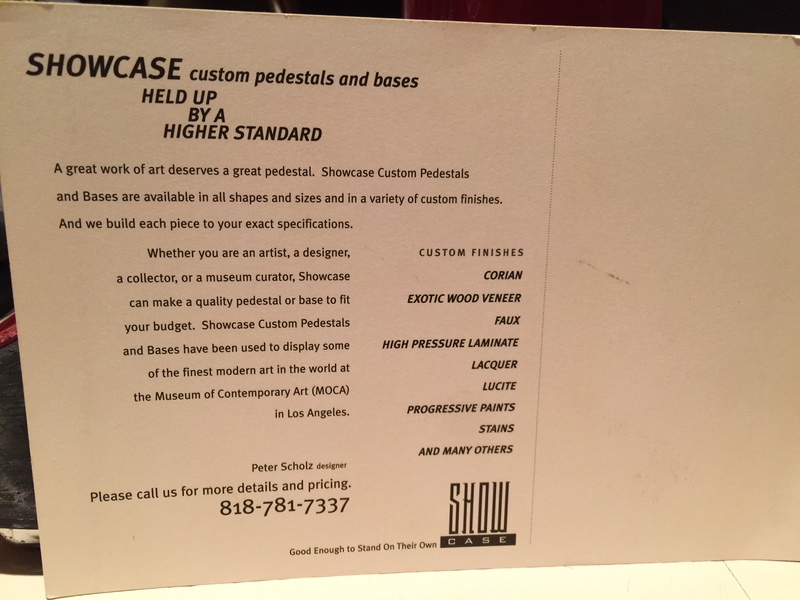 He wanted, somehow, to take the modest and self-effacing excellence he embodied and make custom cabinets and custom showcase podiums for architects, designers and clients in Beverly Hills, Hancock Park, Brentwood, Pasadena, Malibu and Westwood. 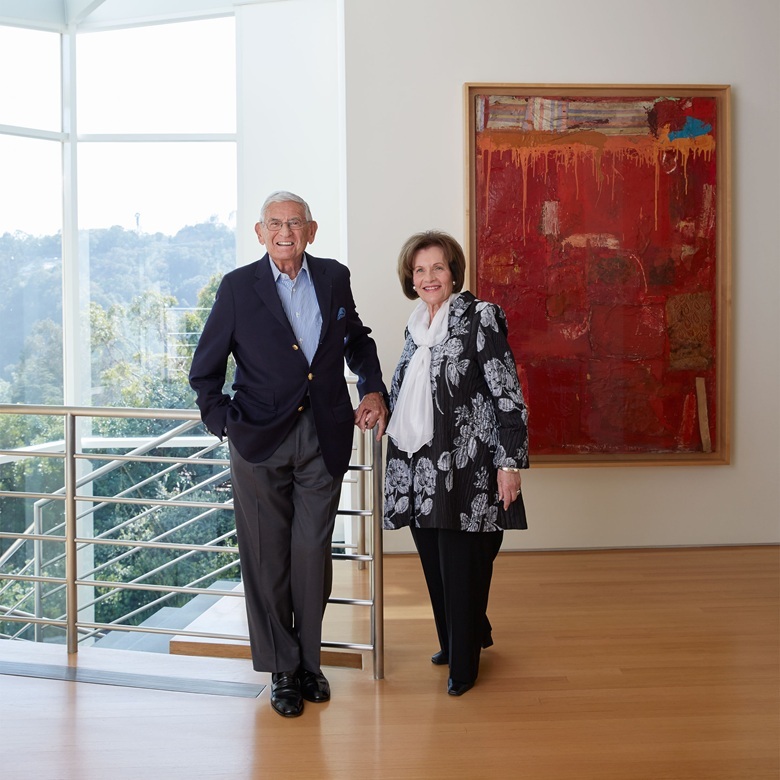 He was introduced to notables who became clients, such as Eli Broad, real estate mogul, art collector and philanthropist; and Robert Graham (1938-2008), sculptor, born in Mexico, married to actress Angelica Huston. 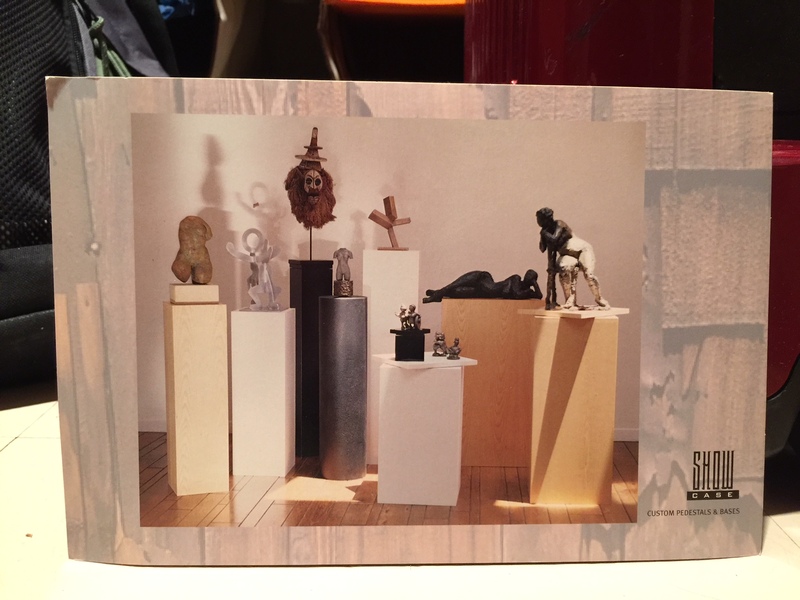 Still only in his early 20s, he started Showcase Cabinets, a name reflecting that his creations, his products, were showcases (custom pedestals and bases) to display art, objects, sculptures. In 1984, at age 20, he married ( eventually divorcing after 20 years), had two kids, Niko and Jessica, and he has two granddaughters as well. Annie, his girlfriend of eight years, also works in the shop. They live with their son Erik, 14, in a 1950s modern house near Valley College which they gutted and remodeled. It has white walls, a backyard pool, orange front door, and solar shades. The house is filled with a cacophony of eccentric and colorful artwork, sculpture, bright colored chairs and, most imaginatively, a graffiti painted bathroom that seems inspired by the interior of a NYC subway car, circa 1985. He seems to have started everything, work, marriage, fatherhood, at an early age. In 2009, he also bought the building where he now headquarters Showcase Cabinets, Inc. He and Annie travel, often to her home country, Bulgaria, where they use her family house as a base point to explore Europe, including Greece, Italy and Germany and everything two hours or less from that point. He employees some 10 people in his bright, 4,200 SF, well-run shop. 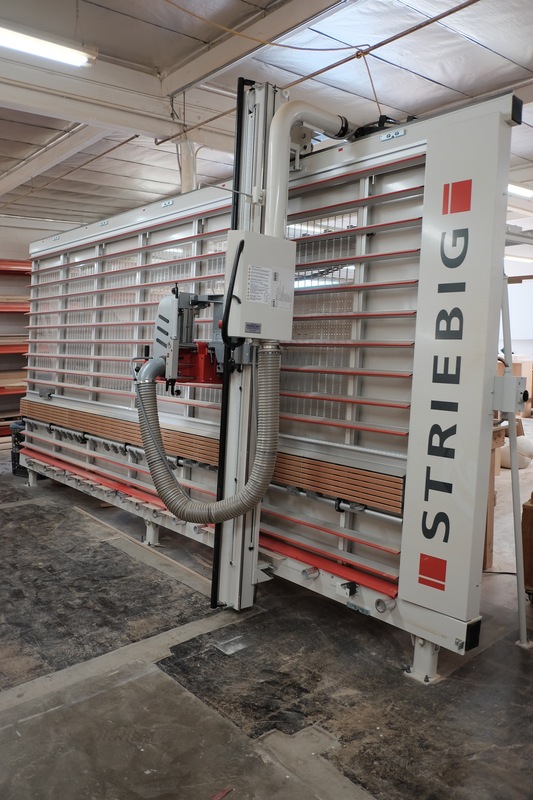 Last year, they invested in a $30,000 Striebig Compact Vertical Panel Saw, made in Switzerland, which is accurate to 1/100 of a millimeter or 0.0003937008 of an inch. His business, which is very healthy, is all word-of-mouth. In an era of social media, of pretending to be successful by posting doctored images and endorsing products, Peter earns his money in the real world of tangible, material substances made out of trees. 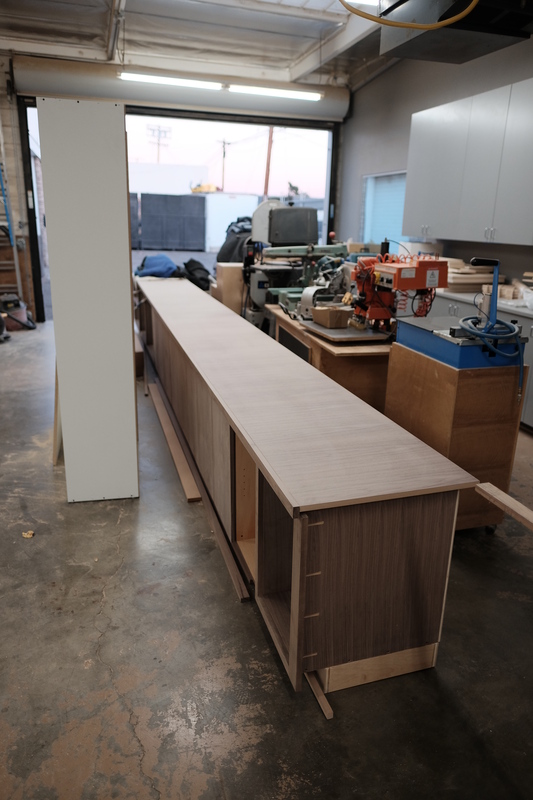 There is no need for Photoshop when you rub your hands over a smoothly buffed, 30 foot long, walnut bookcase. 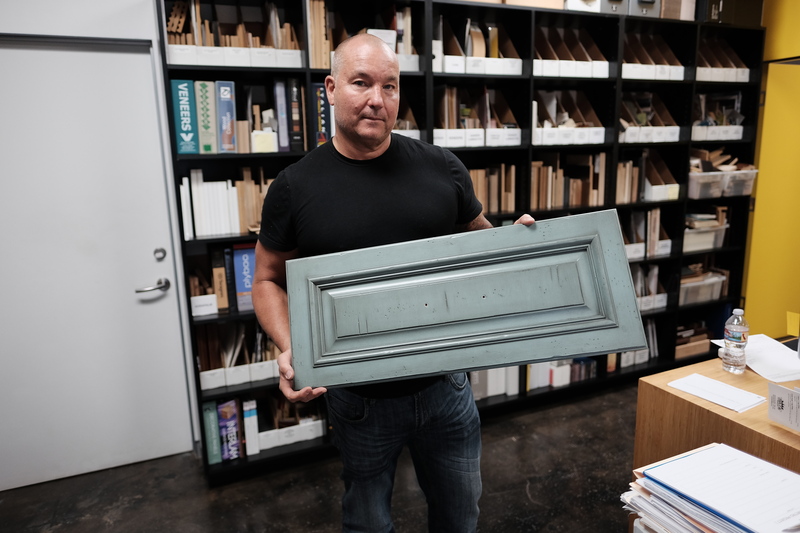 His location, 20 minutes from Beverly Hills, and within easy distance of the 405 and the 101, is ideal for clients, designers and architects who often want to drop by the shop to choose finishes, to see the craftsmen at work, to witness what they are paying top dollar for. And Peter welcomes them. He has everything to show and nothing to hide. 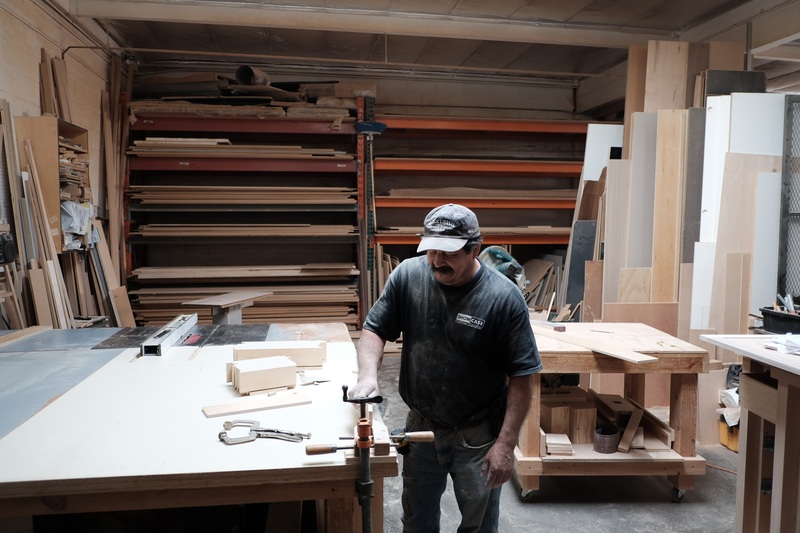 His raw materials come predominately from Valencia Lumber in Lake Balboa and Phillips Plywood in Pacoima. He also sends work to GL Veneer, Inc. in Huntington Park. Showcase gets the orders and this is passed up and down the economic food chain. He deals with stress through kickboxing, the gym, and yoga. 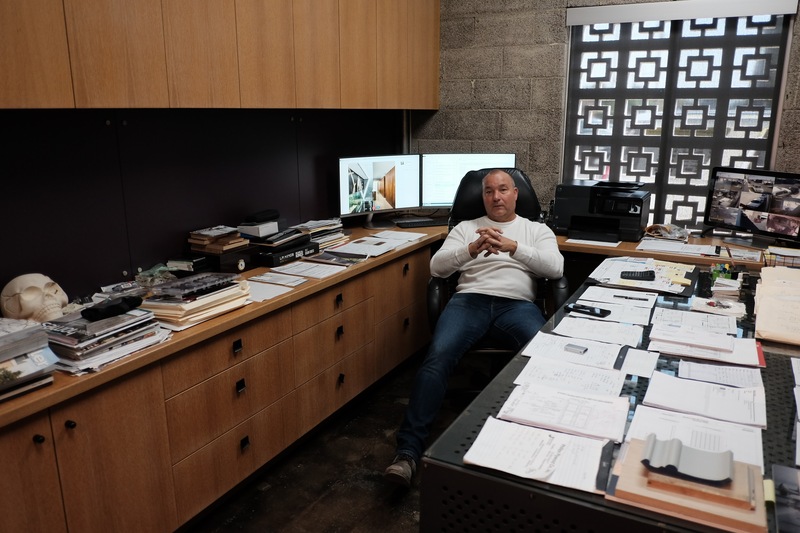 He has some very nice bottles of Japanese whiskies lining an office shelf, in a room built of concrete block, anodized steel walls, and a one-way detective style mirror to keep an eye on the shop floor. The wall facing his long desk is decorated with large format photographs of drug busts, tattooed gangsters, guns and illicit substances which his son-in-law, a cop, shot from an Iphone. There is an air of bad boy badness in Peter Scholz but it seems to be more artistic expression than real life activity. But one would not care to incite him. He acts formidable…. and it doesn’t look like an act. If he were an actor, he could play a felon or a cop convincingly. He exudes menace and kindness equally. Because he is happy in his life and work he projects his good fortune onto Los Angeles. “There is no better place to live,” he said, without irony. Option A: Metro Plans to Demolish 33 Acres of Industry for One Big Rail Yard. Ed Kirakosian, Peter Scholz, Ivan Gomez, Daniel Gomez. Hanging over all this is the “Option A” scheme by Metro Los Angeles which might condemn Peter’s shop and 185 other small businesses, covering 33 acres, in an area north of Oxnard to Calvert, from Kester east to Cedros. This is ostensibly for a future light rail maintenance yard. Opposition to the scheme immediately sprung up and Peter produced big yellow banners against Option A now hung all over the area. 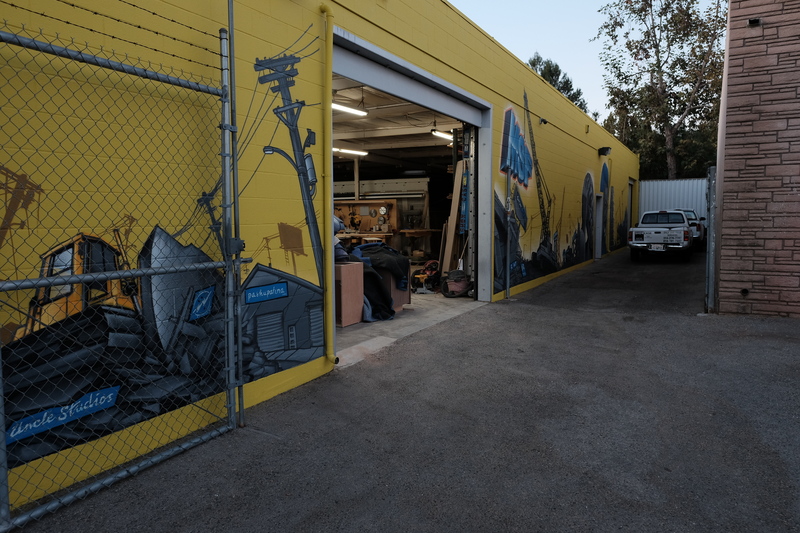 Boldly, by instinct, in his customary manner, Peter marshaled his creative connections to hire artist Guy Ellis (#dcypher_dtrcbs) who painted a long mural on the exterior wall of Showcase. It is in the style of 1930s social realist protest. It is powerful and jarring, screaming, in deathly ashen gray, and living bright yellow, a cry against the potential destruction of the area. If Option A is withdrawn, and the area is permitted to continue existing, Peter has plans to keep the mural up on his building, and even more plans to revitalize the district with the help of his neighbors, friends, investors, architects and innovative developers. 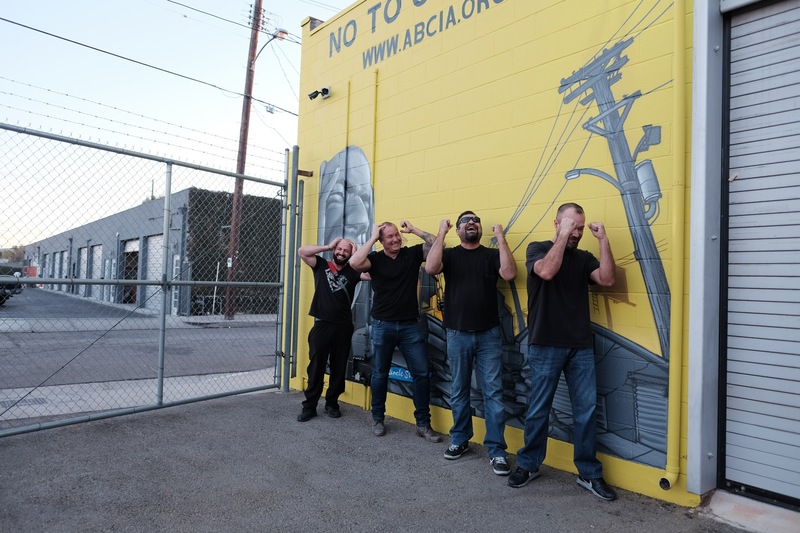 Showcase Cabinets, Inc. and the life and work of Peter Scholz, is yet another reason to drop the idea that wiping out a section of Van Nuys, and scattering her most creative and productive class, is progress at its finest. ← Option A: The Vespa Whisperer.